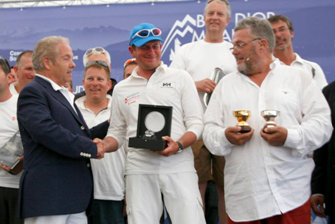 Bol d'Or trophy - Hello Skipper! Europe’s most prestigious freshwater regatta, Bol d’Or Mirabaud, will start for the 77th time on June 13th with a lot of excitement and hard duels to come. 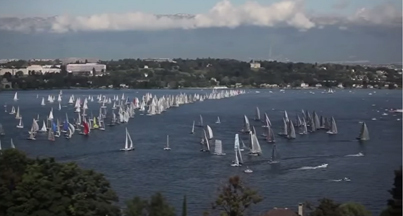 The race is very simple starting from Geneva, sail to the other end of the lake, turn at Bouveret and come back. The shortest distance is 123 km (66.5 nautical miles). 1. 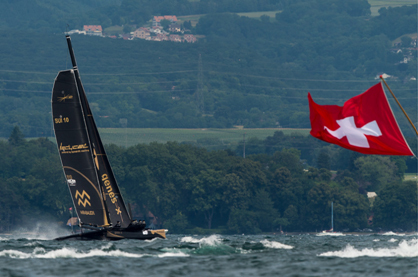 The race is organised since 1939 by the prestigious Yachting Club Geneva(SociétéNautique de Genève), known worldwide as they host the 2-times America Cup winner team Alinghi – the only winning team coming from a country without a sea. The number of participants grew from 26 to the record of 684 in 1990, and the number of participating boats is usually more than 500 with 2,500 crew onboard. 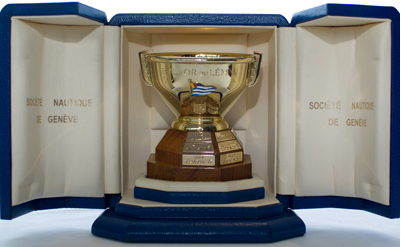 The race is for two important prizes, Bol d’Or (“Golden Globe” best overall) and Bol de Vermeil (“Ruby Globe” best mono-hull). The trophies can be kept by the winning team only if they win it for 3 times in 5 years. Winning the trophy for 3 times is extremely difficult, Bol d’Or was kept three times only, le Marie-José IIby Horace Julliard (1961, 1962 et 1963), Altaïr IX by Philippe Stern (1980, 1982 et1984) and Alinghi by Ernesto Bertarelli (1997, 2000 et 2001). Bol de Vermeil was introduced in 1996 to give a fair chance to mono-hulls. It was kept two times, Raffica, owned by M. Valerio, (1996, 1997, 1998) and Tilt, owned by A. Schneiter and P. Firmenich, (2002, 2004 and 2006 victories). The 2014 Bol d’Or Mirabaud set up a number of records due to the excellent wind and brought unforeseen surprises. Dona Bertarelli and Yann Guichardaboard Ladycat, the Decision 35 catamaran powered by Spindrift Racing won the race with a new record of 5:38:18 ahead of Realstone (Jerome Clarc) and Alinghi 1 skipped by Ernesto Bertarelli, brother of Dona Bertarelli. Dona Bertarelli, the first woman to ever win, earned her second victory after her 2011 triumph, much to the discontent of her brother, the 6-time Bol d’Or and 2-time America’s Cup winner Ernesto (both from Switzerland’s richest family), so you can expect a tough race again in 2015. Other contenders are Realstone (2012 winner), Zenith Fresh (2013 winner) and possibly Zen Too. The 2014 regatta for mono-hulls brought a huge competition between the Hungarian team of Raffica(winner 2012, 2013) and Syz& Co (winner 2007, 2011) skipped by Jean Psaforaghis. Raffica under a different owner, M. Valerio, was already a 3-time winner btw. 1996-1998. It was a tough race among the two, onthe way back, Syz& Co chose the Southern side and put onthe spinakker after hesitation due to the strong wind. Raffica having chosen the Northern side sailing back followed, but due to a sudden wind the boat capsized next to Nyon, so Syz&Co won the race with a record mono-hull time of 08:09:33. 2015 edition will be extremely interesting for mono-hulls, both Raffica and Syz&Co have the chance for winning Bol de Vermeil for the 3rd time in 5 years. Other contenders with a good chance are Oyster Fund (also owned by the Syz&Co group, winner in 2005, 2008 & 2010) as well as Full Pelt X. The boat class with the most participants is Surprise (25ft long), the most popular boat on Lake Geneva. 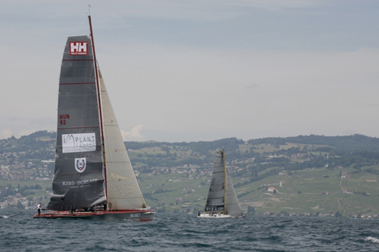 Mirabaud, the naming sponsor owns the boat with the highest chances:Mirabaud 1 skipped by Cyrus Golchan& Antonio Palma (CEO of Mirabaud) – they won almost all the recent races (2011, 2013, 2014). Other notable teams are TeoJakob, Le Marieflo and Mayer Opticien. The race will start at 10am on June 13th, hopefully withexcellent conditions to witness the duels of the Bertarellis, Ladycat vs. Alinghi and among mono-hulls Raffica vs. Syz& Co. Make sure you have a fantastic spot for the spectacular start, follow the race online and this is the only time of the year you can enter the member-only club of La Nautique.